Everyone knows that marsupials carry their young in pockets and are generally confined to Australia. But one thing about marsupials that doesn’t get nearly enough attention is the fact that they’re cut off from other mammals on Earth is exactly what their survival has depended on—because so-called placental mammals are generally more evolutionarily successful, and have mostly dominated wherever the two classes share an ecosystem. That means that when a marsupial goes extinct, it’s like losing a piece of an ancient puzzle that we’re still trying to put together. That’s what happened to the Tasmanian tiger—or at least, it’s what scientists have believed to have happened. But a new expedition aims at settling the question once and for all. The Tasmanian tiger more closely resembled a canine than a feline, and its other common name, Tasmanian wolf, paints a more accurate picture of its appearance and behavior. But it was no more closely related to dogs than to cats. Instead, the largest known carnivorous marsupial was most accurately described by its technical name, the thylacine or Thylacinus cynocephalus—”dog-headed pouched one”. By the time Europeans colonized the island of Tasmania, the tiger had likely dwindled to a population of 5,000, and extermination programs in the 19th and 20th centuries didn’t help matters. Spurred by a bounty placed on the animals’ hides, hunters made short work of Tasmania’s apex predator. The bounty was rescinded in 1909, but the tiger didn’t receive protected status until 1936—and three months later, the last known specimen died in captivity. It’s been more than 80 years since there’s been a record of a living Tasmanian tiger, but scientists have not yet abandoned the search for elusive hangers-on. The most recent of these endeavors is also one of the most advanced, and most hopeful. After a pair of detailed accounts of an encounter surfaced from a long-time park ranger and an experienced outdoorsman, researchers set up 50 camera traps in Queensland’s Cape York Peninsula. Whether the cameras turn up a living specimen of a thylacine or just a marsupial version of Real World remains to be seen. Tasmanian Tiger (Thylacine) photographed at the Hobart Zoo. When Is A Tiger Not A Tiger? 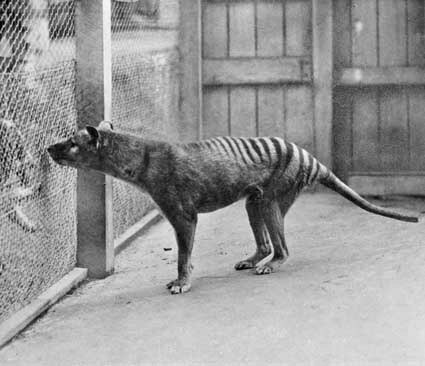 So we’ve established that Tasmanian tigers are not dogs, but it’s still hard to believe when you look at one. Their skulls are so similar to those of wolves and foxes that they’ve even been known to fool biologists. If it weren’t for their pouches or stripes, they’d be nearly indistinguishable from any lean, long-nosed mutt. This is a phenomenon known as convergent evolution, and it happens when two unrelated species happen to settle on the same design to fill the same ecological niche. So while marsupials like the Tasmanian tiger broke off from placental mammals long before there was even such a thing as the dog, they still came to bear an uncanny resemblance to each other.